This is 2 coats of Essie Sole Mate. 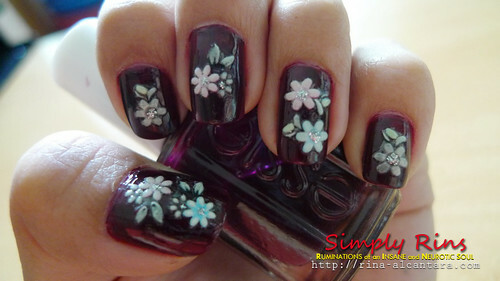 When applied, it looks like plum in color. 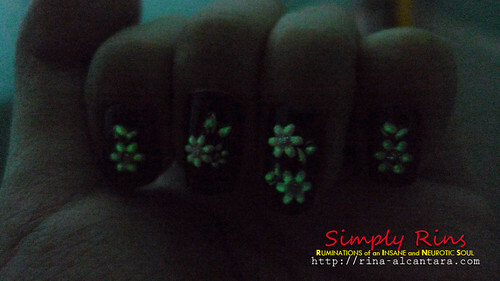 I applied 1 layer of top coat after placing the nail art stickers. I was surprised though when I was about to sleep and turned off the lights. The stickers glow in the dark! I just have to take a picture! It took me several takes before I was able to capture the effect in photo. It doesn't last though. After half an hour, the glow disappears. You have to "recharge" the stickers with light to see the effect again. I can't remember if the stickers I bought were really glow in the dark type. I usually take them off the packaging as soon as I get home and place them in another plastic containing all my other nail art stickers.